I have mixed feelings about this kind of book. Personally I don’t get a lot out of reading them – I would rather have a book that reads through with ‘proper’ text – but a lot of people do like this kind of bite-sized format, with two page articles, the left a couple of hundred words of text and the right an image to support the text. 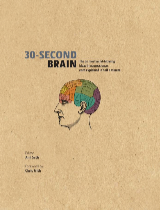 Frankly, some work a lot better than others, and for some reason, 30-Second Brain is one of the better ones in the series. Perhaps because there isn’t a lot of mathematical depth to the subject, the short essays did build up a rather nice picture of our knowledge of the workings of the brain. I was rather unnerved to see the discredited Freud mentioned, but it was only a passing reference, and wasn’t really supporting one of his top-of-the-head (literally) theories. There are an awful lot of good popular science books out there on the brain, and I would regard this as a smorgasbord taster – an opportunity to sample some of the delights, but being aware that, for instance, if you wanted to know more about the impact of brain training, you should pick up a copy of Smarter. Overall, a sound and informative addition to the series.